If you know me, it's no secret that I'm obsessed with Publix. I worked there during and post high school and to shop anywhere else on a regular basis is blasphemy in my home. I actually worked for a handful of years at the Publix in Citrus Park, right across the street from my high school. It's the only Publix in Tampa with a cooking school and I have to say, it's pretty neat! With a fully-functional kitchen, Publix cooking schools make learning a meal fun for everyone. The Publix cooking schools offer cooking classes for friends, family, couples and kids. While each Publix has a full-time chef who hosts the vast majority of the classes, they are also fortunate enough to have renowned chefs, authors, cooking celebrities and restaurant chefs come into their store to host a class or put on a demonstration. In fact, Wolfgang Puck himself visited my Publix while I was working there! Now, Michael Angelo and his mom Sara, the two behind the Michael Angelo Gourmet Foods Italian frozen meals, will be visiting two local cooking schools to put on a Italian holiday meal demonstration. Michael Angelo's is one of the only frozen meals that I'll actually eat and how exciting that he chose the Publix schools to share a unique holiday meal! 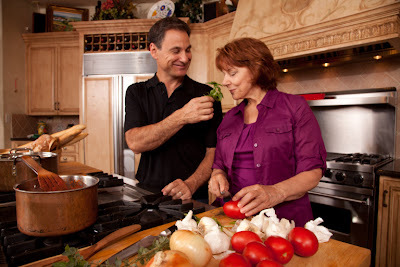 Michael and his mom will be at the Publix cooking school in Tampa on Thursday, October 18, and he will spend the next evening, Friday, October 19, at the Publix cooking school in Sarasota. Tickets are $45 per person and you can register for the class on the cooking school website. Tiramisu hand-dipped in Belgium dark chocolate, garnished with zabaglione, raspberries and blackberries. Now, the lovely people at Michael Angelo are supplying me with two single-serve vouchers and two family-serve vouchers to give away to one of my readers! All you have to do is comment below (please be sure you leave your email address is the comment if you don't use it to sign in) and tell me what your holiday tradition is AND what your favorite Michael Angelo frozen meal is, if you have tried any. Contest runs from now until next Saturday, October 13th at midnight. Good luck! Favorite holiday tradition: Cider. Lots of it.